Camping Les Confluents can be found north of Auxerre, just outside the town of Migennes, next to the stadium and sports complex, and close to the River Yonne. This is a small family site, recently (2012) under new ownership. There are 61 pitches here, 39 for touring (eight are hardstanding) and the remainder are used for chalet accommodation and tents. They vary in size (80-150 sq.m), are divided by hedges, with good shade, and all but ten have electrical connections (6/10A). This is a convenient overnight stop when travelling south/north on the A6. The nearest town is Migennes, accessible within 15 minutes on foot. It has a good selection of shops and a supermarket, and a popular market on Thursday mornings. 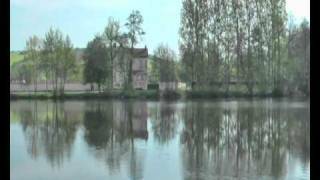 It is best known as the northern entry point of the Canal de Bourgogne from the Yonne and is popular with boaters and anglers. This is pleasant walking/cycling country and the site’s friendly managers will be pleased to recommend routes. Modern, central sanitary block, divided into three sections, can be heated and has good adjustable showers. Well maintained facilities for babies and for disabled visitors. Washing machine and outside drying lines. Bar/snack bar with TV. Takeaway. Small swimming pool. Children’s pool. Play area. Entertainment and activity programme in high season. Mobile homes to rent. Approaching from the north (Paris), leave A6 motorway at the Joigny exit and head east on D943 to Joigny and continue on the same road to Migennes. The site is well signed here. 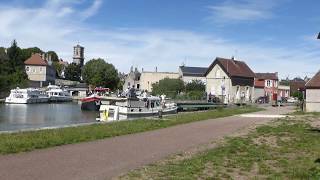 Clamecy , le canal du Nivernais , le 17-08-2017 .